This is where Elite Productions started and has recently grown. With 26 docks the Detroit location is stocked with our largest inventory of seating, staging, and crowd control equipment. 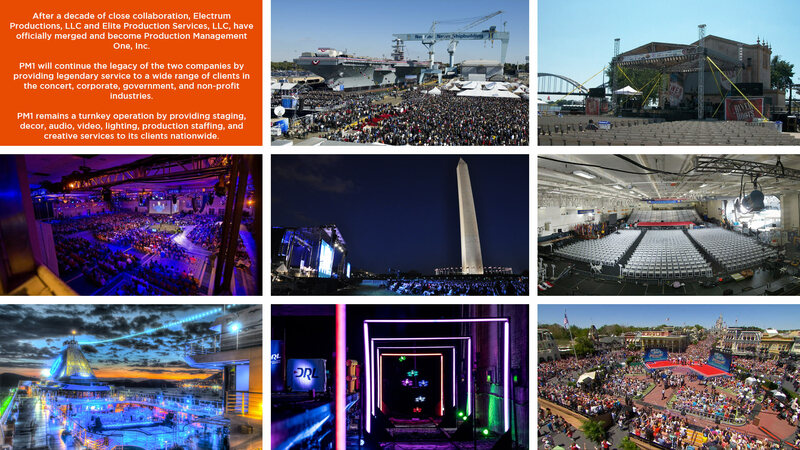 With over ten years in the DC area, the former Electrum Productions staff are now supplemented with gear, teams, and experience from PM1's nationwide presence. When PM1 purchased the assets of Performance Staging, we gained a warehouse, clients and pool cover capabilities in the Southeastern United States. When it comes to making jaws drop and creating peak experiences for your event's attendees, it all starts with design. We use an integrated approach to design and every job goes through an extensive CAD checklist for equipment lists, safety, and sightline evaluations. Not all gear is equal. While many production companies strive to "own nothing" you'll find that PM1 takes a different approach. From our warehouses in Detroit, Washington DC, and Orlando we stock as much seating, staging, and event production equipment as possible. If it's a stage, seating system or pool cover we guarantee it's ours. PM1's specialization in full event production comes from decades of being the go-to people for handling events from start to finish. Our success in handling the most elite jobs in the nation has become our backbone for excellence and capability. Find out why we've been cleared to work on the most iconic jobs in the country.